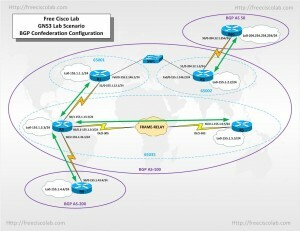 In this free cisco GNS3 lab you will learn to configure BGP confederation as a method to use Border Gateway Protocol (BGP) to subdivide a single autonomous system (AS) into multiple internal sub-AS’s, yet still advertise as a single AS to external peers therefore reducing the IBGP mesh size. BGP confederations can also help with splitting up your IGP domains. IGP’s like EIGRP or OSPF cannot scale to gigantic routing table sizes. IGP’s also put more emphasis on convergence speed as opposed to stability like BGP. Configure routers R1, 2, 3 and 5 within AS-100 as shown in the network diagram to subdivide the BGP network into 3 smaller autonomous systems; AS-65001, 65002, and 65035. Then advertise the routes to AS-50 and 200. A GNS3 topology with the basic configuration of all routers and IP addresses has been preconfigured for you. I have also included the solution configurations for all routers but don’t cheat yourself do the lab before reviewing the solution. Configure OSPF within AS 100 so the routers can reach each other’s loopback interfaces. Configure IBGP within AS-100 but create confederations, using AS-65001, AS-65002, and AS-65035. Configure EBGP between AS-50 and AS-100. Configure EBGP between AS-200 and AS-100. Advertise all loopback0 interfaces in BGP. Ensure all loopback0 interfaces are reachable throughout the BGP network. Can’t find the c3620-JK.bin IOS. Does it realy exist and where can I find it except cisco-systems? That is the issue with GNS3 you need a real Cisco IOS in order to use it.